Insulin was discovered in 1921 by Banting and Best who demonstrated the hypoglycemic action of an extract of pancreas prepared after degeneration of exocrine part due to ligation of the pancreatic duct. 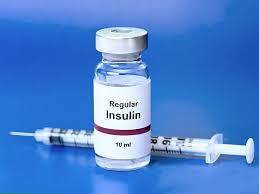 Insulin is a two-chain polypeptide having 51 amino acids and MW about 6000. The A-chain has 21 while B chain has 30 amino acids. There are minor differences between human, power and beef insulins. Insulin is synthesized in beta cell of pancreatic islets as a single chain polypeptide Preproinsulin (110 AA) from which 24 AAs are first removed to produce Proinsulin. The connecting or C peptide (35 AA) is split off by proteolysis in Golgi apparatus; both insulin and C peptide are stored in granules within the cell. The C peptide is secreted in the blood along with insulin. 1. Insulin facilitates glucose transport across the cell membrane; skeletal muscle and fat are highly sensitive. The availability of glucose intracellularly is the limiting factor for its utilization in these and some other tissues. 2. The first step in intracellular utilization of glucose is its phosphorylation to form glucose-6-phosphate. This is enhanced by insulin through increased production of glucokinase. Insulin facilitates glycogen synthesis from glucose in the liver, muscle, and fat by stimulating enzyme glycogen synthase. 3. Insulin inhibits gluconeogenesis from protein, FFA and glycerol) by gene mediated decreased synthesis of phosphoenolpyruvate carboxykinase. 4. Insulin inhibits lipolysis in adipose tissues and favors triglyceride synthesis. 5. Insulin enhances transcription of vascular endothelial lipoprotein lipase and thus increases clearance of VLDL and chylomicrons. 6. Insulin facilitates AA entry and their synthesis into proteins, as well as inhibits protein breakdown in muscles and most other cells.